Throw rocks into the Mississippi River: I don’t know why kids can throw rocks for hours, but they can, and kids have been throwing rocks into the Mississippi for about 200 years (interesting fact: there is no natural rock in our soil so kids only started throwing rocks in New Orleans once we started importing rocks here). This can actually be fun for everyone though: grab a muffuletta from Central Grocery, a po-boy from Johnny’s (no website and cash only, but it’s at 511 St. Louis and you can order ahead at (504) 524-8129) , or a delicious ice cream daiquiri from The Gazebo (or all three) and head to the river. Sit and enjoy the sandwiches and frozen cocktails, enjoy the view and the breeze, and people-watch as the kids work on their throw. Go to the French Market: this is truly one everyone will enjoy. It’s covered (shelter from rain and heat! ), loud, and there’s something about a bustling open-air market that connects us to the most ancient of social activities. Favorite food for the kids: roasted corn on the cob, crepes (Nutella and bacon-yum! ), snowballs, Zapp’s potato chips, deep-fried peanuts (eat the shell),and alligator jerky. Favorites for the parents: shrimp tacos, freshly-shucked raw oysters, muffuletta from Alberto’s, and Meals from the Heart’s crab cakes. 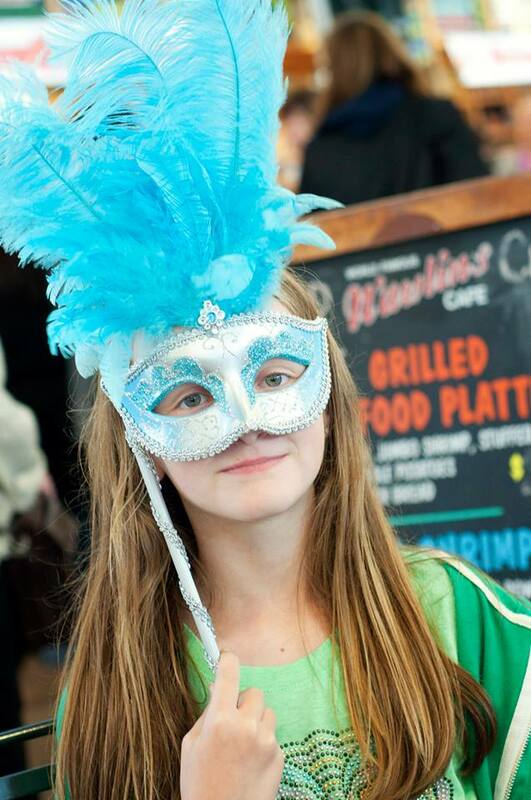 Then, shopping: the kids love the personalized bracelets, customized Legos, Mardi Gras masks, and wooden puzzle boxes. Parents find great souvenirs and at least one unique item that can become a family memory of your trip to New Orleans. Preservation Hall: I have to admit, kids will not like the waiting in line part of this experience. The adults will, because there is no better people-watching than in this vibrant block in the heart of the French Quarter. But that’s why there’s Reverend Zombie’s Voodoo Shop across the street and Dante’s Pizza and a souvenir shop in the same block. One adult can make field trip and refreshment runs with the kids while the other holds the place in line. Once you get in, everyone will enjoy the brassy, energetic sounds of classic Dixieland jazz in an authentic New Orleans atmosphere that no Hollywood set designer could dream up. To skip the line, buy Big Shot tickets on their website. 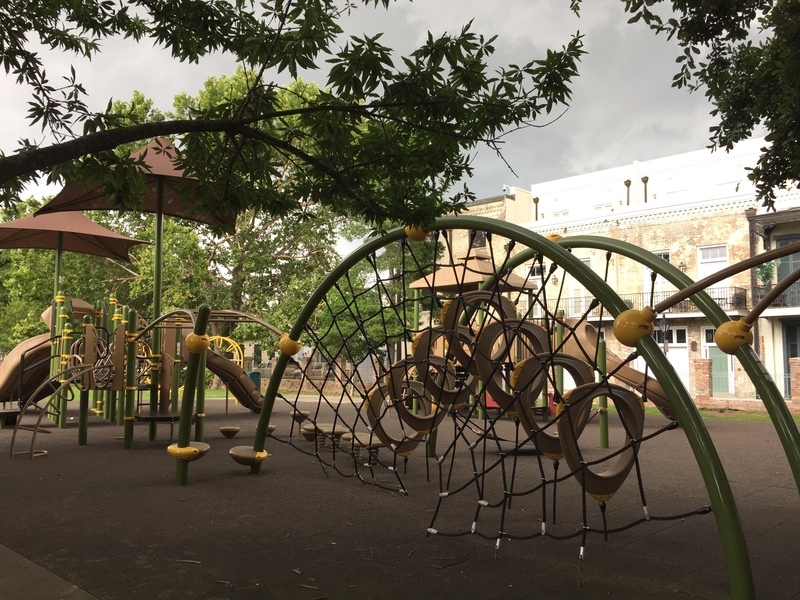 Cabrini Park: This is a city-owned park and playground right in the French Quarter, with a new play structure and some running-around space. 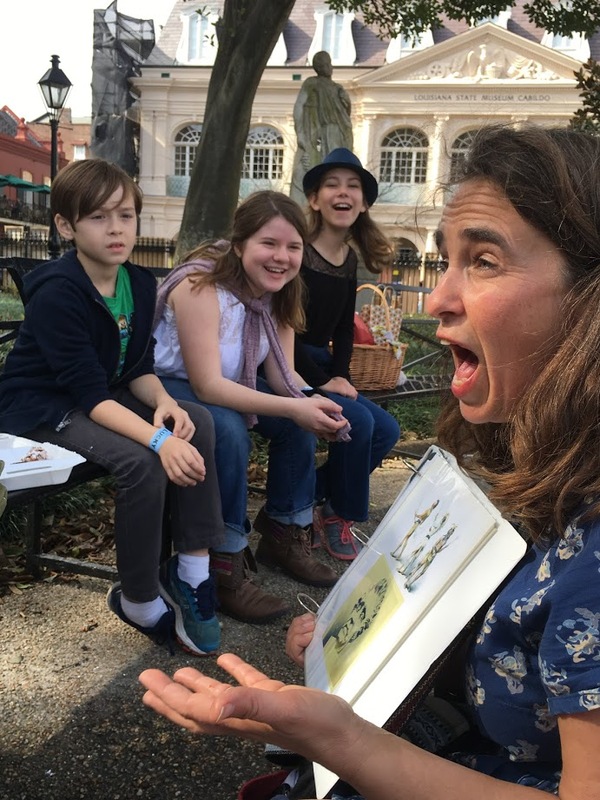 It is in the residentia l end of the French Quarter at 931 Barracks Street (at the corner of Dauphine) so bring a picnic, let the kids climb and run, and sit and admire the Victorian and creole architecture that surrounds you. There is also a hose hookup with running water so on hot days, bring water guns (you can get them during the summer at the “big” Walgreens on Canal Street and Barronne). As for the picnic, this is your opportunity to stop at Verti Marte and order from their huge menu. Verti Marte is a tiny corner grocery with some of the greatest poboys and entrees in town. I suggest the All That Jazz poboy – a messy concoction of shrimp, ham, cheese, mushrooms, and a special secret sauce -but bring extra napkins. They don’t have a website so you can google them, try to read posted photos of their menu, and call in your order at (504) 525-4767. But I strongly recommend going there and ordering in person for the full experience. Verti Marte is at 1201 Royal Street, on the corner of Royal and Governor Nicholls. 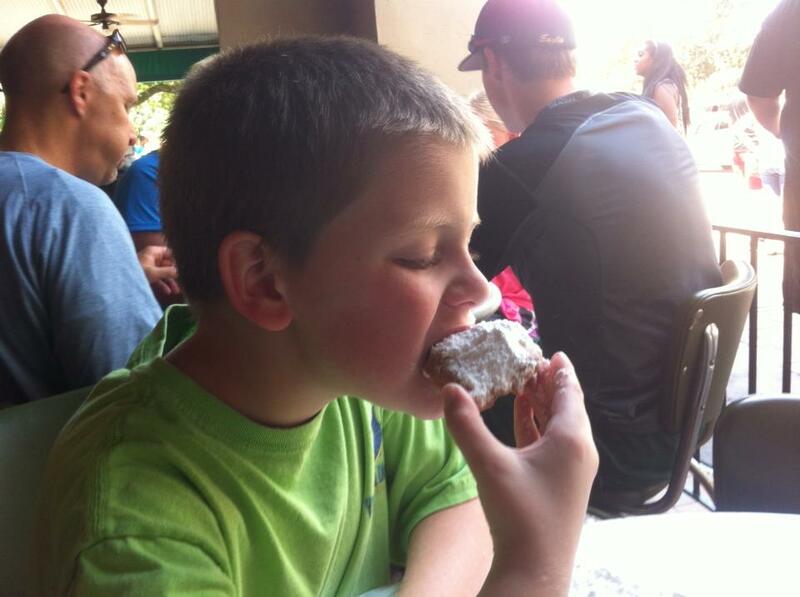 Cafe du Monde: This jewel opened in 1862, so if your kids’ great-great grandmother visited New Orleans, she could have had sat in the same spot and eaten the same thing your kids can have today! It’s so simple – fried dough with powdered sugar on top – but so perfect and delicious. And yes, the kids can have coffee! New Orleans-style cafe’ au lait, which is still served here in the traditional way, is made with half chicory coffee and half boiled (not steamed!) milk, so by volume only a quarter of the cup contains coffee. That means it is very low in caffeine, so kids drink cafe’ au lait and you can have it at night. There is also orange juice, milk, and chocolate milk available, but the only thing to eat is the beignets – but that’s really all you need! Enjoy the sights, sounds, and atmosphere and create sugar-coated memories here! Canal Street-Algiers Ferry: This is public transportation (2.00 each way) but a really enjoyable ride across the widest expanse of the third-largest river in the world. Pedestrians and bike riders (no cars) catch it at the Canal Street Ferry Terminal near the Audubon Aquarium and ride across to Algiers Point, the second-oldest neighborhood in New Orleans. This is your opportunity to experience a real New Orleans neighborhood, and the neighbors in The Point are friendly! Once in Algiers Point, you can explore the Victorian neighborhood, have a drink, a quick bite, or a great meal at Dry Dock Cafe. There is also Confetti Park, a great little neighborhood playground, and the levee is paved and lighted and provides benches along the river for strolling or biking. Jackson Square: Really, you can’t avoid this one. The Square is the heart of New Orleans and it is in every travel book, brochure, and movie about New Orleans. But it really is a great place for the whole family. Photo opportunities abound, it’s fenced so the smaller kids can run out some energy, and plenty of benches provide both sunny and shaded spots to sit for a bit. 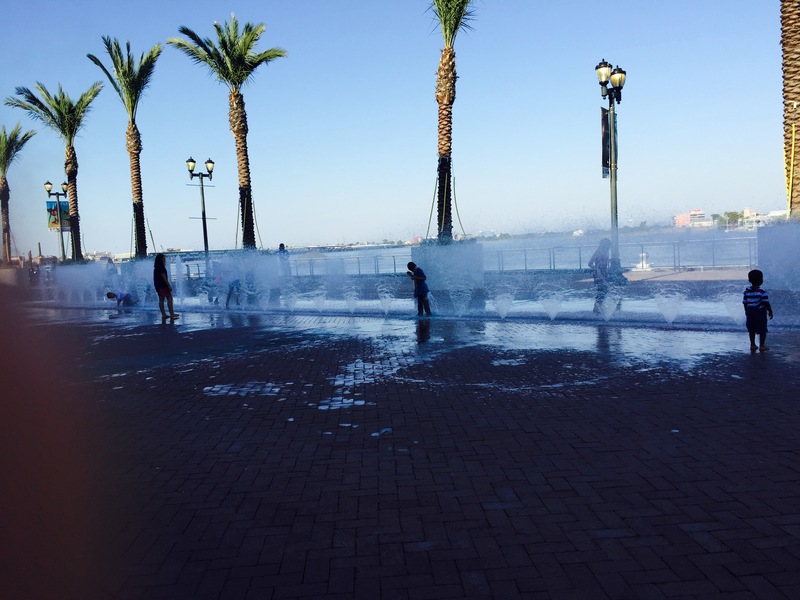 Kids will enjoy nesting in the low palm trees and tossing pennies in the fountain. In the four corners of the square are four marble statues which represent the four seasons, erected in 1851. Since they are not labeled, it is truly enjoyable to walk with your kids to each statue and try to figure out which is which. Outside the square are artists, with their paintings and other artwork on display, caricature artists, and portrait artists. You can have a portrait of your kids or the whole family made. 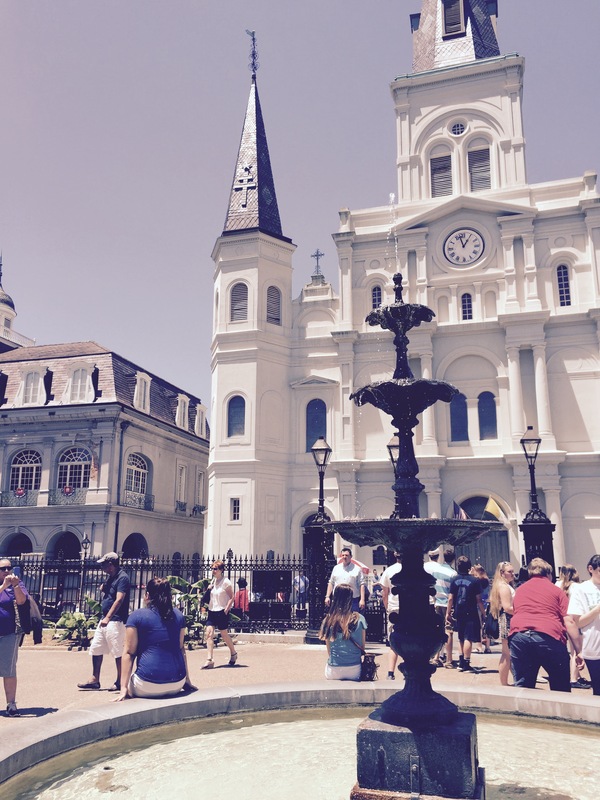 In the plaza in front of St. Louis Cathedral, there are jugglers, musicians, magicians, sword-swallowers, and other performers. For a small tip, you can get an excellent photo with a beautifully-costumed pirate or a living statue. Steamboat Natchez: The last true steamboat on the Mississippi River, the Natchez is a true ride in a time machine. 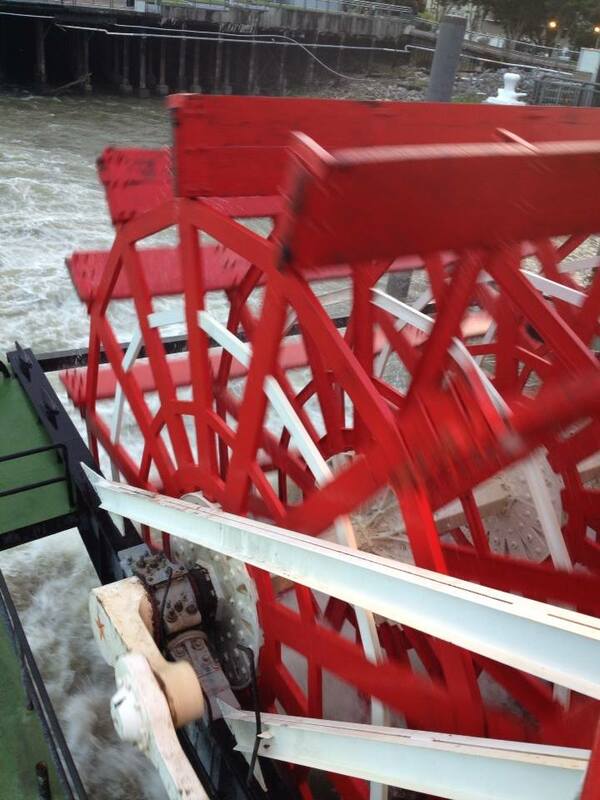 Everyone loves to watch the massive red paddle-wheel churn up the ancient waters of the Mississippi, and you can tour the engine room downstairs or catch a river breeze on an upper deck. Cruises are offered at 11:30, 2:30, and 7pm daily, with optional buffet. There are snacks, drinks, and a souvenir ship on board, and a jazz band on every cruise. Best of all, kids under 6 ride free! There are brochures and kiosks all over town where you can purchase a ticket to ride on the Natchez, or click here for their website. Audubon Aquarium, Insectarium, and IMAX Theatre: I included these all in one because they are typical suggestions you’ll get in this sort of list, and I’ve tried to stay away from typical suggestions. However, I love all three of these. 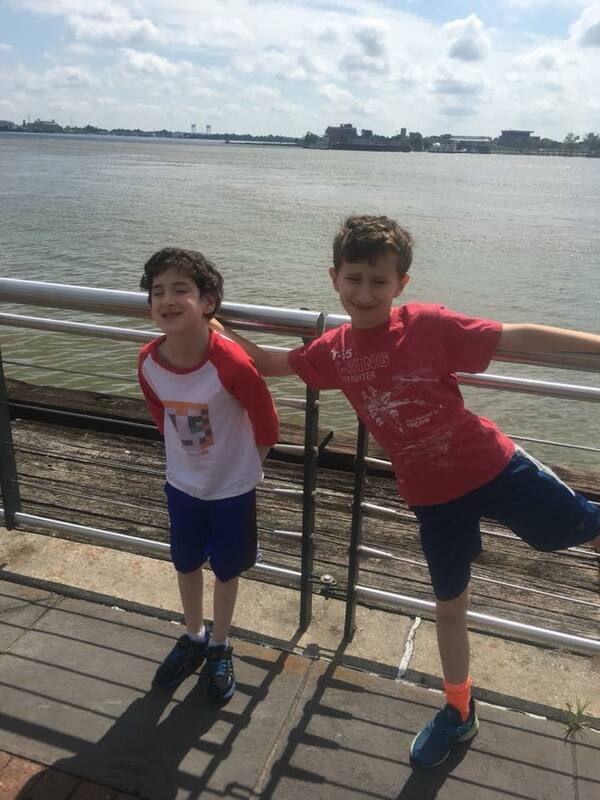 I am raising my children in New Orleans, and I keep my membership to Audubon active so we can enjoy their facilities year-round. Our favorite features of the aquarium are the 90-foot water feature in front of the entrance (bring a change of clothes on hot days because it is impossible to resist running through it! 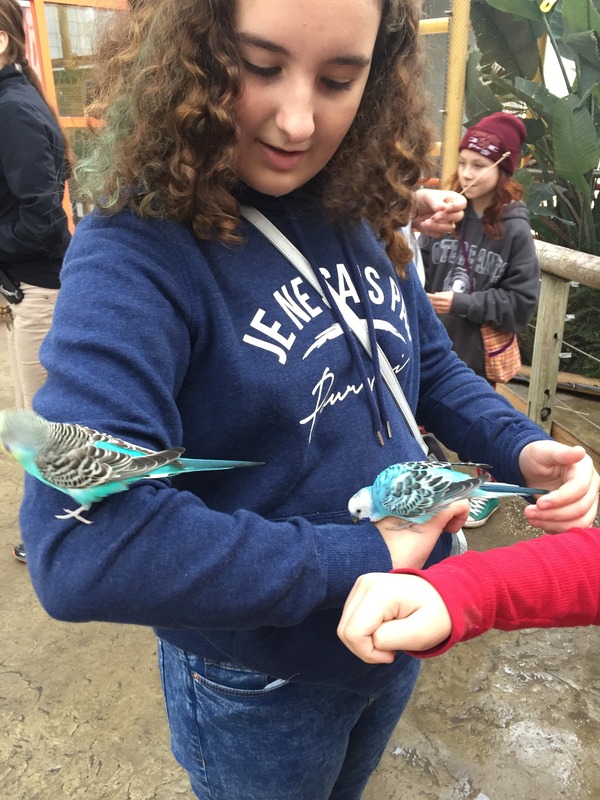 ), Parakeet Pointe, where you can feed parakeets and coax them to land on you for great pictures, and the stingray pool, where you can pet stingrays under the supervision of their staff. At the Insectarium, we love the cafe where you can eat bugs (or pizza and nachos if you’re so inclined), the 4-D movie complete with rumbling seats, aromas, and fun ways to learn about bugs, and the butterfly garden. At the IMAX theatre, there’s always a great feature and you will really be amazed at the 3D effects. You can purchase tickets at each venue, or buy them in advance on their website. Thank you for bringing your kids to New Orleans! You are sharing a valuable experience with them and nourishing their sense of adventure!